Baby room murals are a beautiful addition to any nursery design. They form an eye-catching focal point for the nursery and they are an easy and inexpensive way to fill up large wall areas. 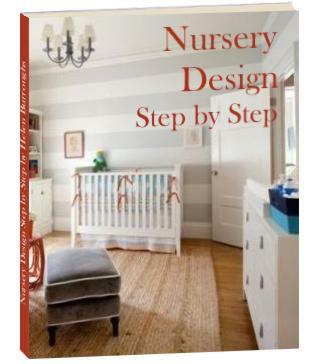 But with a few basic steps you'll see that creating a stunning nursery mural design is much easier than you think. The hardest part is finding the picture that you want to use - after that it's all downhill! This is known as a silhouette mural and is easy to paint because it only has one color. This is a cameo baby mural and is simple to paint because it is small and localized. Murals of trees are very popular and are very easy to paint if you choose something simple like this. Nursery designs like this look difficult, but they are actually just a bunch of cameo murals put together. They take longer but they are easy to paint one character at a time. Sweeping baby room murals that involve an entire scene like this one are the most difficult to paint because the entire background needs to be painted in. Unless you are very adventurous or have experience in art, this type of nursery mural is best left to the professionals. Murals are best painted on the upper portion of the wall so that they are not obscured by furniture later on. One way to achieve this is to use a nursery border or chair rail to separate the top and bottom sections. Paint the bottom section with a solid color and the top section with your mural. You want your hard work to be noticed, so make sure that your baby room mural is on a wall that is easily seen as you enter the nursery. Baby room murals make beautiful focus points above the baby crib. If you are planning a large mural make sure that the nursery wall you plan to use is big enough. If you are planning a small mural either paint it on a smaller wall or complement it with other nursery wall decor. A small mural looks lost on its own on a large nursery wall. This is the hardest part. You can use any picture you find from a magazine, the internet, a coloring book - anything. You can even trace elements from your baby's crib bedding set or comforter. Tip: Use a thin nibbed black pen so that the lines are clear. Make sure you get the basic shape and then decide how much you want to add - include as little or as much detail as you like - you don't have to include everything. 1. Using an overhead projector, project your image onto the nursery wall, adjusting the size until it fits the space you have earmarked for the baby room mural. Tip: If it is not dark enough in the room to use the projector you can cover the windows with foil and painter's tape. 3. Switch off the projector but don't move it until your mural design is complete - otherwise it will be difficult to realign your picture perfectly if you need to add more detail or if you accidentally paint over a line. 4. Fill in your outline using paint in your chosen colors. Tip: If you are using many different colors, small pots of acrylic paint from the craft shop work well. 5. When your nursery mural is filled in and dry, decide whether or not you wish to outline the shapes - this is a matter of personal preference. Outlines can be drawn using an acrylic paint pen in black or a darker shade of the color used for the fill-in. 6. Finally, wipe away any charcoal marks with a damp cloth. And that's it - how to paint a room with baby nursery murals made simple!